The DEPOSIT is non- refundable, non- transferable. The remaining balance will be DUE NO LATER than June 6, 2019, or application is voided. If paying by check, payment must be received in office within 7 business days of registration. If it is not received within this time frame, application will be voided. Insurance Card: Please take a photo of your insurance card. Save to your desktop or phone and then attach it here. We MUST have this on file in case of emergency. SHOT RECORD: We are required by law to have a shot record on file for each camper. Please upload the most recent record here. Take a picture with your phone, save it to your desktop, then upload. If shot record is not received within a week of application submission, registration will be voided without reimbursement. ROOMMATES: Please list the names of who you would like to room with, we will do our best to accommodate but it is not guaranteed. Please select shirt size here and then under payment options select camp shirt. T-Shirt Size: Please carefully select select size. The size you mark will be the size presented to you at registration. Shirts are $12 and can be purchased online until June 6th. Shirts will also be available for purchase at camp store. DVD of Camp - $10: DVDs will also be available for purchase at the camp. I have had sufficient opportunity to read this entire document and its terms and conditions. I have read and understood it, and agree to be bound by it's terms. 1. I acknowledge that outdoor adventure based activities such as ropes or challenge course activities, painitball, swimming, and all other physical activities entail known and unanticipated risks that could result in physical or emotional injury, paralysis, death, or damage to myslef, to property, or to third parties. I understand that such risks simplcannot be eliminated without jeppardizing the essential qualities of the activity. The risks include, among other things: This program is based on the "challenge by choice" principle. At any time you and/or your group are free to withdraw from participation in ropes/challenge course activities, paintball, swimming, and all other physical activities and it's potential for: slips and falls and falling; rope burns; accidental drowing, pinches, scrapes, twists and jolts that could result in scratches, bruising, sprains, lacerations, fractures, concussions, or stings, allergies, and associated diseases. Furthermore TXCOG employees & volunteers have difficult jobs to perform. They seek safte, but are not infallible. They might be unaware of a participant's fitness or abilities. They might misjudge the weather or other environmental conditions. They may give incomplete warnings or insturctions, and the equipment being used might malfunction. 2. I expressly agree to assume all of the risks existing in previously stated activities. My participation is purely voluntary, and I elect to participate fully aware of the risks. 3. I herby voluntarily release, forever discharge, and agree to indemnify and hold armless the TXCOG form any and all claims, demands, or causes of action, which are in any way connected with my participation in previously stated activities or my use of TXCOG's equipment or facilities, including any such claims which allege negligent acts or omissions of TXCOG. 4. Should TXCOG or any one acting on their behalf, be required to incur any legal fees and costs to enforce this agreement, I agree to indemnify and hold them harmless for all such fees and costs. 5. I certify that I have insurance to cover any injury or damgaeI may cause or suffer while participating, or else I agree to bear the costs of such injury or damage myself. I futher certify that I assume the risk of any medical or physical conditions I may have. 6. In the event that I or my representative files a lawsuit against TXCOG, I agree to do so solely in the state of Texas, and I further agree that if any protion of this agreement is found to be void or unenforceable, the remaining document shall remain i n full force and effect. By signing this document , I acknowledge that if anyone is hurt or property is damaged during my participation in this activity, I may be found by a court of law to have waived my right to maintain a lawsuit against TXCOG on the basis of any claim from which I have released from herin. I have had sufficient opportunity to read this entire document . I ahve read and understood it, and I agree to be bound by it's terms. 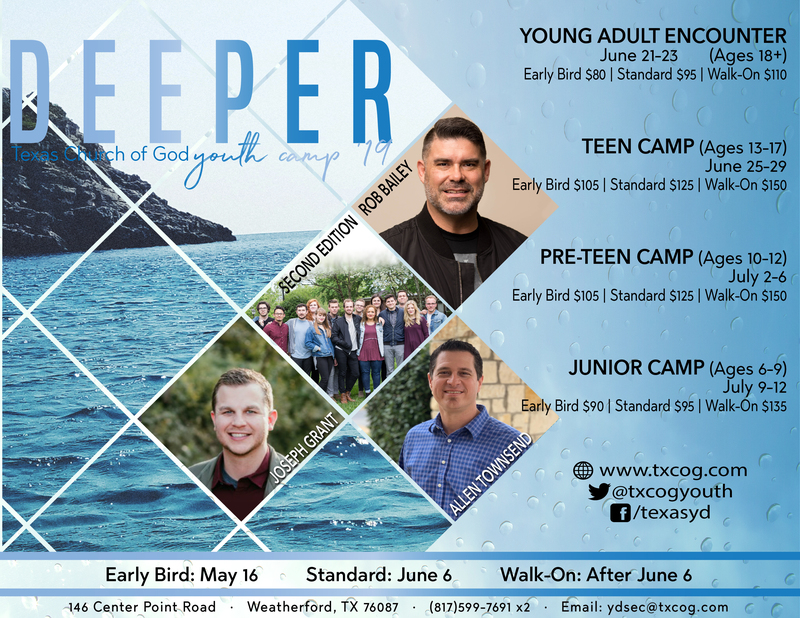 I hereby give my child permission to attend and participate in Texas Church of God Youth Camp. 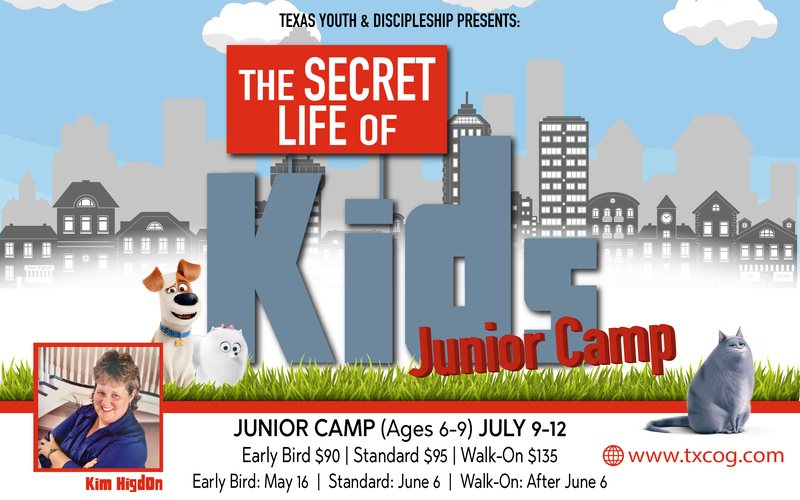 I hereby waive, release, and discharge any and all claims, demands, and causes of action against Camp officials, the Church of God in Texas, and the International Offices of the Church of God, their agents, employees, and participants arisiing from any damages, property loss, or injury my child sustains at Texas Church of God Youth Camp. I further consent to allow Camp Officials to seek and obtain emergency medical or surgical treatment for my child should my child need medical treatment. i further grant permission for my child to appear in Camp Videos and any promotional videos or photography. I fully understand that my family's insurance is the primary carrier for all accidents incurred at camp and the camp's insurance is the secondary carrier. I agree to the terms and conditions in the Parent/Guardian Terms and conditions clause above. Water Baptism will be advocated for students who make a personal committment to follow Christ. Water Baptism will take place on the final service of camp for Teen and Pre-Teen Camps.